This kid camp letter went viral last week when his mom posted it on her blog, Hairpin Turns Ahead. In the blog post the mom wrote about how last year her 8-year-old went off to summer camp and she spent the entire time he was away waiting for him to write her. She wanted to hear from him so badly she started imagining what her son would say once he did. It was something along the lines of "Thank you so much for letting me go to camp. I have learned so many cool things, like how to take a fish off the hook, tie sailing knots, and even how to groom a horse." That sounds great, doesn't it? Well, the letter the mom ended up receiving sounded NOTHING like that picture-perfect camp letter. 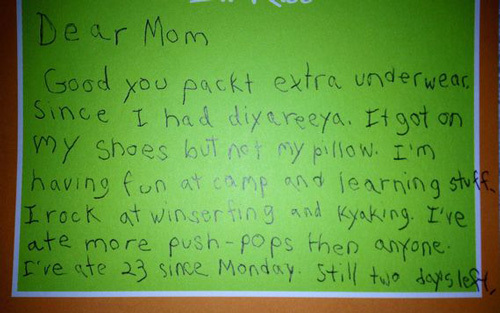 Instead, the mom blogger got the funniest kid camp letter of all time, below. In it her son talks about "diyareeya,' eating more push-pops than humanely possible, using other kids' toothbrushes, burping the alphabet backwards with a friend, and shooting a rifle. Wha?! Oh, and he also informed his mom (in case she didn't know already) that farts can be lit on fire, which he has clearly been trying out. In the blog post the mom wrote about how last year her 8-year-old went off to summer camp and she spent the entire time he was away waiting for him to write her. She wanted to hear from him so badly she started imagining what her son would say once he did. It was something along the lines of “Thank you so much for letting me go to camp. I have learned so many cool things, like how to take a fish off the hook, tie sailing knots, and even how to groom a horse.” That sounds great, doesn’t it? Well, the letter the mom ended up receiving sounded NOTHING like that picture-perfect camp letter. 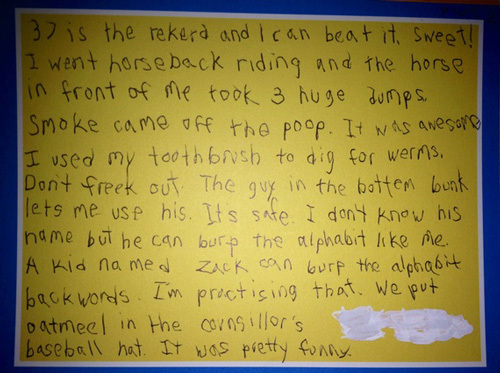 Instead, the mom blogger got the funniest kid camp letter of all time, below. In it her son talks about “diyareeya,’ eating more push-pops than humanely possible, using other kids’ toothbrushes, burping the alphabet backwards with a friend, and shooting a rifle. Wha?! 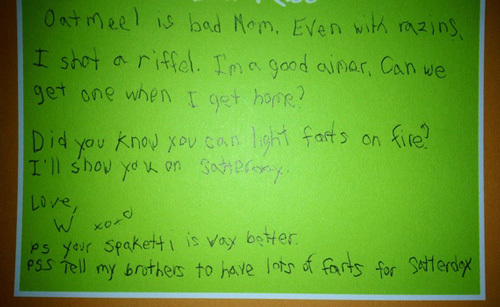 Oh, and he also informed his mom (in case she didn’t know already) that farts can be lit on fire, which he has clearly been trying out.